Christmas: What’s the Reason For This Season? Editor’s Note: Christmas is almost here! But what does the Christmas season really mean to a Chinese international student? Sometime in the last month, perhaps you traced your finger down a candy cane’s stripes and savored its sweet, minty goodness. Hung some ornaments up on your tree or tapped your foot to a Christmas jingle. In America, come December, it’s hard not to feel immersed in the holiday season. It’s crooned about on the radio, taught about on advent Sundays. It echoes out from Salvation Army collection tins, shines down at us from glimmering lights. Here, the Christmas season has a certain feel, a certain sound, a certain significance to it that’s just plain hard to miss. But Christmas isn’t quite like that in China. Though some of our holiday trappings have made it over across the Pacific, most of their significance has not. While faux-fir trees abound, covered in tinsel, and Santas peek from behind many a store window, few people you’ll ask will really understand why those things are even associated with Christmas. Images are reproduced and traditions are mimicked, but no one really knows why any of it exists. And that is just talking about the cultural side of things. A friend of mine was downright shocked when I explained what the “Christ” in Christmas was actually referring to. He had never even considered that the name “Christmas” itself held any meaning. I doubt he is alone in that. Though certainly, this new batch of international students is more culturally aware and savvy than those that came before, only a small percentage of these students will have ever given a second thought to Christmas’ significance. And why should they? In China, Christmas is an excuse to put down your books and to buy yourself a nice reindeer sweater. A chance to act and feel just a little more “western” when you pull on a Santa hat and put a little more money into the economy than you normally would. But for most, Christmas comes and Christmas goes — and the world is no different for it. In fact, December 25th isn’t even when most students will choose to celebrate, if they celebrate at all. Instead, Christmas eve (平安夜 ping an ye) is when many will exchange the punny gift of an apple (苹果 ping guo), shop, treat their friends to dinner. They’ll fall asleep that night fully expecting to attend their regularly scheduled classes that next Christmas morning. For those of us who know the good news of Christmas, then, it can be a daunting thing to think of sharing its significance with our friends, to imagine filling in the gaps, and connecting the dots of how everything fits together. The truth is, it is no easy task. There is a lot of untangling that needs to be done before students will be able to see Christmas as not just a cultural holiday, but a spiritual one. Before they understand that Santa and Jesus are not really all that related. And yet, isn’t it an exciting thing too to be able to share of the God who stepped out of eternity and bound himself willingly into time and space? To boast of He who traded the praise of angels for the scorn of men; the throne of heaven for a trough of hay? In the midst of all the hustle and bustle of the Christmas season, we have the privilege of introducing our friends of the Creator God who chose not to just sit idly by as His creation fumbled in the dark; but became man so that he might lead men to the light, out of death, and into life. As Christians we get to point our friends to the truth that the greatest Christmas present ever given was not bought with money, but with the blood of a most precious Savior. It was not just some gadget wrapped in a box, but a child, wrapped in cloth, and lying in a manger. And that is some very merry news indeed! What parts of the Christmas holiday experience (traditions, symbols, images) might an international student be curious to learn more about or to experience? How might you use those things to share with them about the biblical narrative of Christmas? 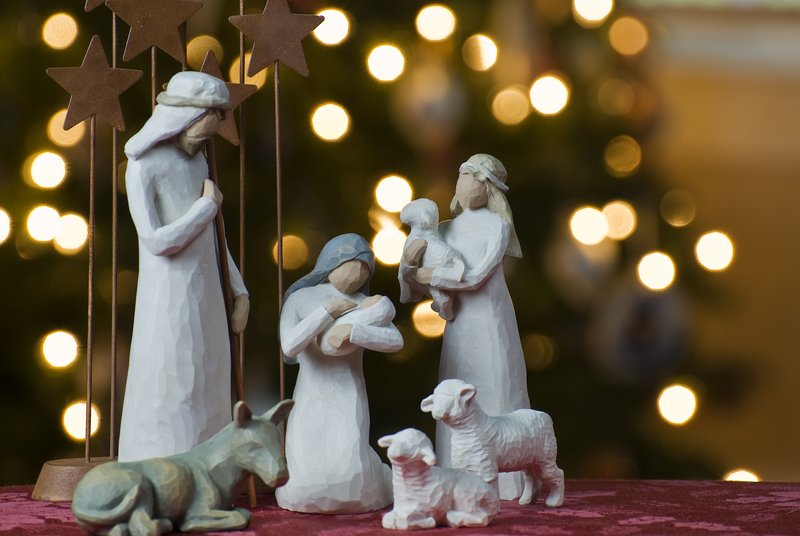 How would you explain the story of Christmas to a person who may never have heard it before?